It has long been thought that the so-called “Golden Ratio” described in Euclid’s Elements has “implications for numerous natural phenomena... from the leaf and seed arrangements of plants” and "from the arts to the stock market." So writes astrophysicist Mario Livio, head of the science division for the institute that oversees the Hubble Telescope. And yet, though this mathematical proportion has been found in paintings by Leonardo da Vinci to Salvador Dali—two examples that are only “the tip of the iceberg in terms of the appearances of the Golden Ratio in the arts”—Livio concludes that it does not describe “some sort of universal standard for ‘beauty. '” Most art of “lasting value,” he argues, departs “from any formal canon for aesthetics." 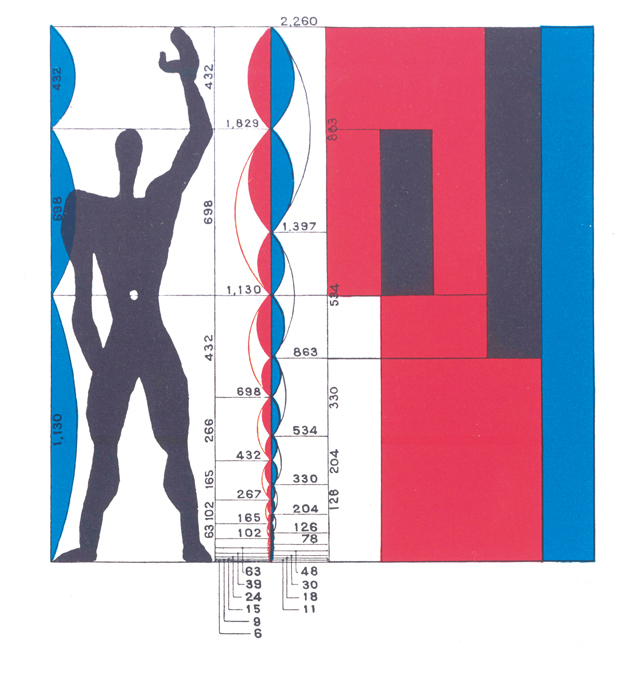 We can consider Livio a Golden Ratio skeptic. Perhaps now, we need an artist to render a “Fractal Man”—or Fractal Gender Non-Specific Person—to represent the latest enthusiastic findings of math in the arts. This time, scientists have quantified beauty in language, a medium sometimes characterized as so imprecise, opaque, and unscientific that the Royal Society was founded with the motto “take no one's word for it” and Ludwig Wittgenstein deflated philosophy with his conclusion in the Tractatus, “Whereof one cannot speak, thereof one must be silent.” (Speaking, in this sense, meant using language in a highly mathematical way.) Words—many scientists and philosophers have long believed—lie, and lead us away from the cold, hard truths of pure mathematics. This study produced some inconsistencies, however. 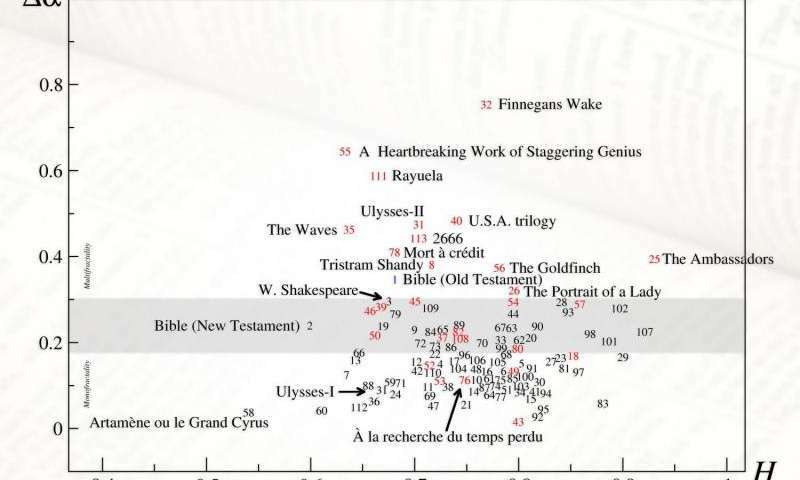 In the graph above, you can see how many of the titles surveyed ranked in terms of their “multifractality.” A close second to Joyce’s classic work, surprisingly, is Dave Egger’s post-modern memoir A Heartbreaking Work of Staggering Genius, and much, much further down the scale, Marcel Proust’s Remembrance of Things Past. Proust's masterwork, writes Phys.org, shows “little correlation to multifractality” as do certain other books like Ayn Rand’s Atlas Shrugged. The measure may tell us little about literary quality, though Professor Drożdż suggests that “it may someday help in a more objective assignment of books to one genre or another.” Irish novelist Eimear McBride finds this “upshot” disappointing. “Surely there are more interesting questions about the how and why of writers’ brains arriving at these complex, but seemingly instinctive, fractals?” she told The Guardian. Well, here’s a fractal skeptic. It’s possible to find all kinds of patterns in a literary text that mean, perhaps, nothing. Jonathan Culler’s discussion of the patterns found by Roman Jakobson in (I think) Baudelaire’s poetry is relevant here. But also: stream of consciousness is a way of representing a character’s thought processes. (Distinguished, too, from interior monologue.) It’s hard to call Finnegans Wake a stream-of-consciousness novel. Ulysses has many passages of stream of consciousness but much else besides. Proust’s In Search of Lost Time is not an example of s-o-c writing. You had me at Dave Eggers. Proust’s novel was one of the novels they said did not have a fractal nature to it. So I don’t think the post meant to describe it as one. Captivated by this thesis and the follow-up Qs and push-backs, here and also at the original guardian publication site. Curious to know where Buster Keaton’s Sherlock Jr. would fall on the graph (see “Passing through the Equal Sign” in book edited by Andrew Horton), or on its analog for works of film. …Not to mention Film, Keaton’s offbeat experiment w/ Beckett. Someone needs to really dumb this article down for me–I’m really struggling to get this. What exactly is fractal about these pieces of writing? 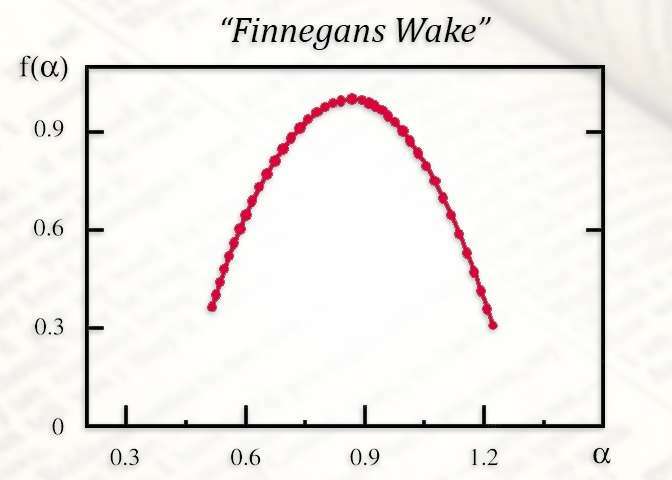 The only thing I got from the article was “sentence length.” Are they saying the fluctuations in sentence length are what make up this fractal shape? My head hurts now, shouldn’t have read this post twice. String Theory is way easier to understand. I’ll try again tomorrow. Some Bach pieces show fractal traits in ways that are much more interesting than sentence length- for example, fugues where the melody predicts what keys the piece will modulate through.